When Frazer is first opened each morning any customer who has exceeded the grace period for making a payment will be charged a late fee. You can determine whether to charge late fees on the current amount due in cases where customers have made partial payments or on the full payment amount regardless. You can choose to apply late fee terms to any new Buy Here Pay Here deal by checking the box here and applying your desired terms. Terms should include a percentage of the payment and a maximum amount as well as a grace period before late fees will be applied. You can also set it to a flat amount after the grace period. Many state will limit the grace period and percentage/amount that can be charged. Frazer will apply a “Cost” to deals with outside lien holders that represents the difference between the amount you would have received if you had financed the deal yourself and the amount you will be receiving from the lien holder. You can choose to apply this cost as either an initial cost of the sale when calculating profit or as a back end cost. Check this box if you would like to exclude the amount that is owed to salespeople when determining the profit on a sale. Checking this box will open the insurance information screen when opening any customer’s account in which the insurance on file has passed its expiration date. When printing the report of a customer’s payment history you can choose to total each column at the bottom by checking here. Frazer will automatically perform online and/or local backups. If something has occurred where no backup has been completed in over a week Frazer will warn you to investigate. Checking this box will open a sale automatically after it has been canceled. The following options allow you to customize how you look at sales and determine the amount of money you have invested or have made in a particular sale. You can choose to include or exclude the commission paid, payoff on a trade, lot fees, government fees like registration and title fees, and repairs incurred after the sale as a cost to the deal. Similarly, you can choose to include or exclude the value of the trade, any deferred down payments and reserve payments received from lenders as credits to the sale. 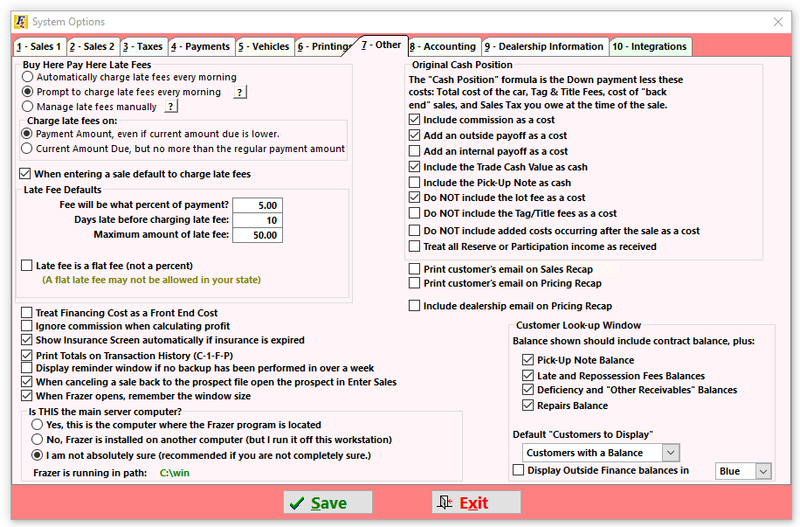 Use these options to to include customer and dealer emails on the sale/pricing recaps if you'd like. When opening the Customer Activity window you can customize it with the options included here. The balance owed can be changed to include any amounts owed as deferred down payments, amounts owed as repair fees, amounts owed as repossession or late fees, or amounts entered as “Other Receivables”. You can select which type of sale to show when first opening the customer look up window and determine whether to highlight outside finance deals with a specific color.